Using the diagram above, I am going to explain the path that amperage takes, as it passes through the Unipolar Cell. For simplicity, try to imagine amperage as a fluid. Amperage from the battery divides equally across the 2 Negative plates as it travels towards the Positive .... on the other end of the cell. There are 2 Neutral Plate Groups in between that it must pass through. The amperage collected on each Negative plate is attracted across the water to the more positive 1 Neutral Group. The amperage combines on the first neutral and then splits equally on the last two 1 Neutral Group plates. From there amperage travels across the water to the more positive 2 Neutral Group plate. The amperage combines on that neutral then splits in half as it travels to the last 2 Neutrals. From there amperage travels across the water and collects on the Positive plate, then proceeds on to the battery. The circuit acts as a Series Cell. The Neutral Groups are between negative and positive electrodes. They create their own isolated water areas, the same as traditional Bipolar Series Cells. - N N + N N - The difference being Series neutrals are Bipolar; meaning they are more negative on one side and more positive on one side, where as Unipolar plate is only one polarity, either more positive or more negative. This Unipolar configuration creates - N N + N N - it does it by creating Paths. There are 2 Paths for amperage to take....across 2 sets of Neutrals. This Unipolar Series Parallel configuration uses 9 plates to configure 6 water areas by way of 2 Paths/Stacks. A 2 stack Bipolar Series Parallel configuration can accomplish this with 7 plates. If another plate is added to each of the Columns in this Unipolar configuration, it accomplishes the same thing as adding another Stack to a Bipolar Series Parallel configuration. If another Neutral Group is added to this Unipolar configuration, it accomplishes the same thing as adding a Neutral Plate to each Stack in a Bipolar Series Parallel configuration. Adding Neutral Groups increases HHO production the same way that adding Neutral plates does in a Bipolar Series Parallel configuration. Now that you know the path amperage takes, lets look at the relationship of amperage and HHO production. Faraday tells us that the gas is made between 2 apposing plates, of different potential. He tells us that 1 ampere makes 0.0003689 CFM of HHO; converting that to metric ...would be 10.44 ML per minute. That is the amount made between two apposing plates. There is no mention of Size of the plates; none what so ever. However, there is mentioned that 1 square inch of surface area can efficiently handle 0.54 amps. If Current Density exceeds 0.54 amps per square inch, we make a lot more heat in the process of making more HHO. What you need to take from this is that it is not plate size that makes more gas; It is the number of water compartments (cells). The more of them you add, the more gas you make. The more of them you put the same amperage through, the higher your MMW will be. Two Unipolar plates can make no more HHO per square inch than two Bipolar plates can make per square inch. However, minor details in construction can help you or hurt you; regardless of polarity type. When I look at Unipolar, I see the same potential for current leakage, from plate to plate, as I see in Bipolar. If the edges are exposed to water, they are just as vulnerable to current leakage as Bipolar plates. If holes are in the plates, they are just as vulnerable to current leakage ....if the edges are exposed. A well known HHO forum mentor/advisor is saying current flows around Unipolar plates and passes through Bipolar plates. That is nonsense. Amperage does not pass through metal; it passes around the surface, perpendicular to the surface. That forum also states that Bipolar does not have Neutrals. Nonsense; if it does not have an electrical connection on it, and current passes across it, what do you call it? A rose is a rose is a rose, no matter what you name it. Unipolar uses Neutral Groups to get the voltage drops between plates. Are there benefits to Unipolar Cells? Some say there are. For instance, they operate cooler. Well yes, they can operate cooler if each Stack/Column does not share water compartments. The same can be accomplished with multiple stack Bipolar Cells, but most builders do not do this. They also say Unipolar operates cooler because of the number of plate Paths. Again, the same can be accomplished with Bipolar Cells by adding more Stacks; builders choose not to do so because it requires more amperage in order to get more HHO gains. Unipolar produces more HHO. Well not so fast. The potential may be there for efficient Unipolar designs, but a like system can be built using Bipolar designs....which will use less plates and produce equal amounts of gas......That is, if you measure them with the same set of meters. Unipolar has been observed to produce bubbles on the back sides of End Plates when they are exposed to water. I should mention, that the same thing happens with Bipolar Plates. The magnetic field is polarized, is it not? Electrons flow towards more positive potentials, while liberated ions are attracted towards opposite potentials. It is reasonable to assume there are liberated ions throughout the entire embodiment of water. Magnetic Field Affect in Parallel Plates. The field size varies with separation distance. Intensity is greatest at the closest points. Enough of my theory. Look at some of the wonderful work the following Experimenters have accomplished. Igor's Unipolar cell is based on a construction technique that came to him in a dream. It made sense; he understood it, so he built it. It worked great and it looks great. What more can one ask for....Right? Well, now he asks, how can I make it better. It is Igor that got me involved with the Unipolar design. It is through his work that I developed my understanding of the Unipolar technique. Visit Igor's dedicated page on this web site. Unipolar Dry Cell Configuration is 10 Plates, 6 Stacks/Columns 60 Plates Total. Producing 1.3 LPM filling a jar. Unipolar Dry Cell Configuration is 7 Groups of 5 Plates; 35 Plates Total. 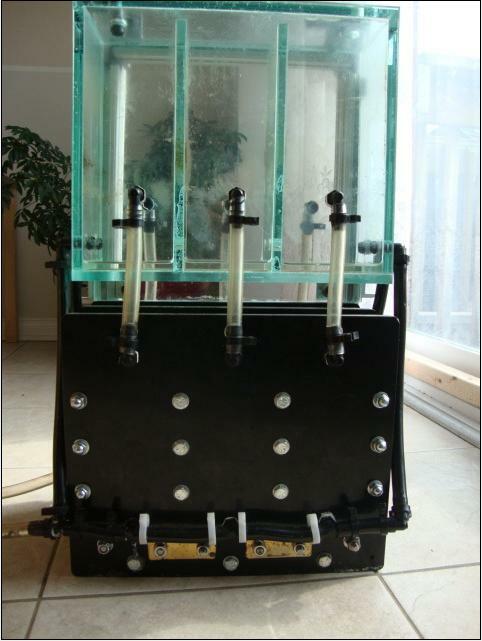 Unipolar Dry Cell Configuration consists of two Different Identical 96 Plate Systems sharing Bubblers. Magnets below, between and above each Column stack. I timed his test and it took 7 seconds to make 1 LPM (he timed 6.1 seconds . I calculated 8.11178 LPM using 111 Amps.